The information is coming together about the new Barking Riverside station. The Wikipedia entry at the moment is not very information, but it does say that the station has two platforms. This map from Transport for London, shows the location of the station. 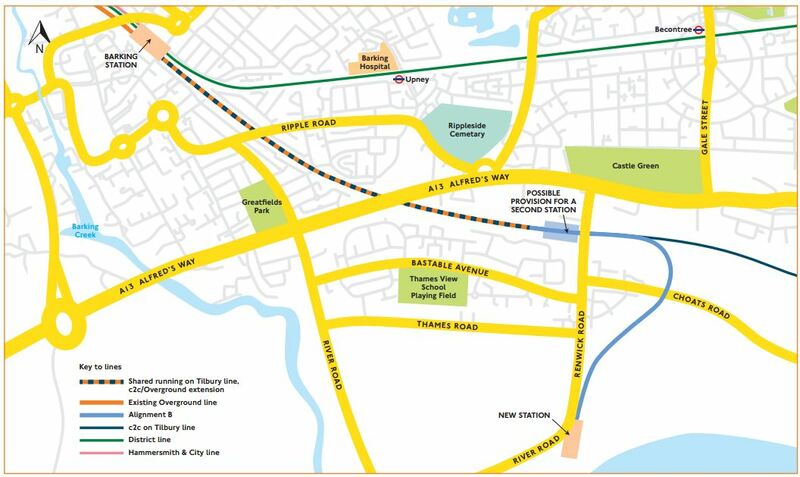 The location of Barking Riverside station is at the end of the branch line that comes South from the Barking to Tilbury Line. As it is a long term ambition of Transport for London to extend the railway under the River to Abbey Wood station, the North-South orientation of the station is probably important. This map from carto.metro.free.fr gives the layout of Barking Riverside station and the tracks leading to it. It shows two tracks leading to a two-platform station, with a crossover to allow both platforms to be used. These are available on this page on the Moxon Architect’s web site. This is the first visualisation on the site. It shows the end view of the station and as no railway lines are visible, I assume that it is looking North, so the River Thames is behind the viewer and Renwick Road is on the left. This is the second visualisation. It shows the station looking from the East towards Renwick Road. Note the bus in both images. As at Hackney Wick station, there is an underpass, so the station is not a barrier to pedestrians. The seventh visualisation shows the station from above. It only shows one platform in the image, as do other visualisations. Is It A Single Platform Station? Is this the way the station will be built or is it just to make the visualisation simpler? A single platform station should be able to handle six trains per hour (tph). This year, this frequency will be implemented between single platforms at Highbury & Islington and Crystal Palace stations on the Overground. The Gospel Oak to Barking Line will have a maximum frequency of five tph in the Peak. The infrastructure and the trains will all be brand new and use the best technology. So it looks like a single platform station should be able to handle the planned number of trains for the simple extension to Barking Riverside station. This is the fifth visualisation. It clearly shows gantries for overhead wires. But it appears that only one platform is there. I have thought for some time, that the Barking Riverside Extension could be built without electrification and battery/electric trains could be used. I laid out my views in Don’t Mention Electrification!. All Aventras are wired for on-board electrical storage. The Barking Riverside Extension is only 1.5 km long. The area of the extension has some very large electricity pylons, that the extension has to dodge through. If the line is extended under the Thames, it would be cheaper to build a tunnel for third rail, as it will connect to third-rail lines on the South Bank. There must be substantial savings by not putting up overhead wires. A safer and more reliable railway in extreme weather. I also repeated my views in an article in Rail Magazine, which I described in I’ve Been Published In Rail Magazine. No-one has told me that they disagree with my views. So why are electrification gantries shown? Transport for London or Network Rail don’t believe that battery/electric trains are possible. This is unlikely, as battery/electric trains have been successfully demonstrated in the UK and elsewhere, and ordered for Wales and Liverpool. Obviously, there has to be a backstop if conventional electric trains have to be used. So, provision is being made to electrify the extension. The single platform is electrified, so that a battery/electric train can be fully-charged before it returns towards Barking and Gospel Oak. If before the station is built, it is decided that electrification is not needed, the overhead wires can be omitted from the construction phase. I do feel though, we will know more about the performance and reliability of battery/electric trains in a few years, and we will alter the designs of overhead electrification accordingly. The station has been built to enable extension to Abbey Wood station on the other side of the Thames. There are probably several designs that would fit with the current station. The simplest is probably to install a second platform and connect both to a tunnel under the river or a bridge over the river. This would have several disadvantages. A lot of the station would need to be demolished. The train service to Barking Riverside station might have to be stopped for several months, during construction. All services would have to cross the river. A better option is probably to install the second platform on a track, that goes under the river in a tunnel. The single tunnel portal would require less land take, as it could be very close to Barking Riverside station. The tunnel under the river could be a mix of single or double track, to create the most affordable tunnel. The current single platform would become a bay platform. 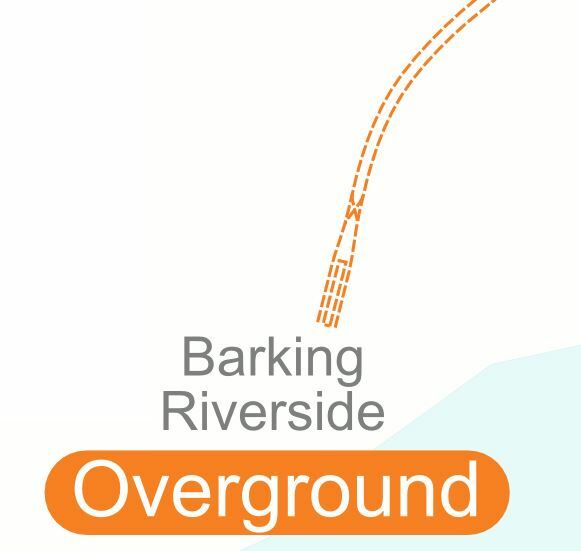 During construction, the service to Barking Riverside station would be able to continue as normal. The bay platform could be used for service recovery in times of disruption. I particular like the idea of a loop railway on the South Bank of the Thames with perhaps four or five stations. Alternatively, it could be a tram-train on the surface. 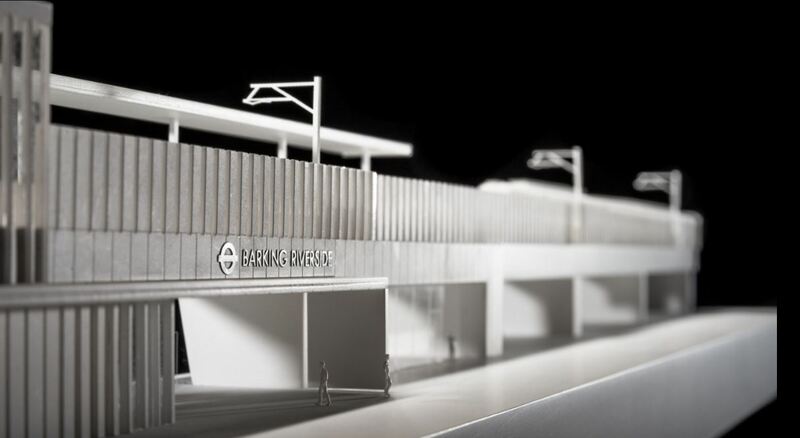 It looks like the design of Barking Riverside station, is one that will cater for all eventualities. I am looking forward to taking the first train to the station.